This procedure requires a recent PDXpert release. With PDXpert PLM software, you can create parts in multi-level structures. While most PLM software users will be quite comfortable navigating the multi-level structure within PDXpert, you may occasionally require a graphical means for showing the product. A picture may be useful during a major design review, or as a navigation reference for manufacturing, product service or customer support staff. In a just few minutes, you can have a graphical view of your bill of material in Microsoft® Visio®. Although this app note uses Microsoft Visio 2010, the technique should also be applicable to later releases. We'll create a new member of the PDXpert Data Transformations collection (see the PDXpert client help guide: Contents > How to use the Collection Explorer > Adding a new collection member). We'll only need to do this once, and then we can use our Data Transformations collection member any time we want to create the export file. Download this file, which contains the data transformation that you'll need. On the Data Transformations collection node, right-click to Add new member. 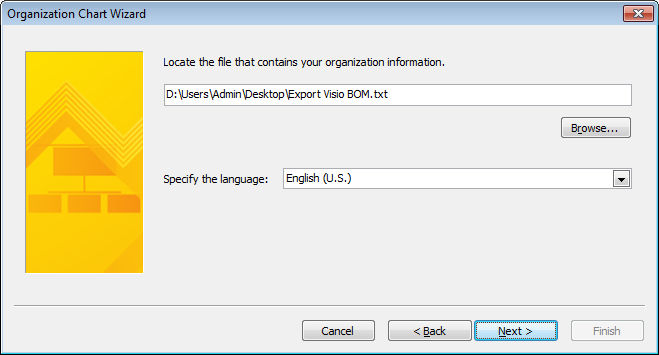 Set the Name to Export Visio BOM. Open the Export-Visio-BOM.txt file in Windows Notepad (not in a word processing application). Copy the entire contents (Ctrl+A, Ctrl+C), and paste it (Ctrl+V) into the new member's XML textbox. Close or lock the window to save your changes. After we have created the new Data Transformations collection member, we're ready to export the multi-level bill of materials. Open the Report/Export Wizard (Tools | Report/Export Wizard...). Select the Export Visio BOM dataset, and click the Next button. Drag a multi-level assembly from the Item Explorer onto the Report/Export Wizard, and click the Finish button. In the Save As file dialog, enter a file name. On the Save as type: dropdown, select Text (tab delimited) (*.txt). Click the Save button. 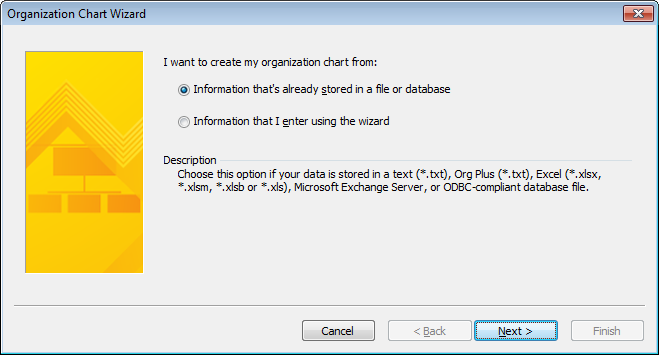 Visio 2016 has a useful utility called the Organization Chart Wizard. It will import a list of relationships and automatically create a hierarchical organization tree, which looks pretty similar to what we'd want for our product tree. 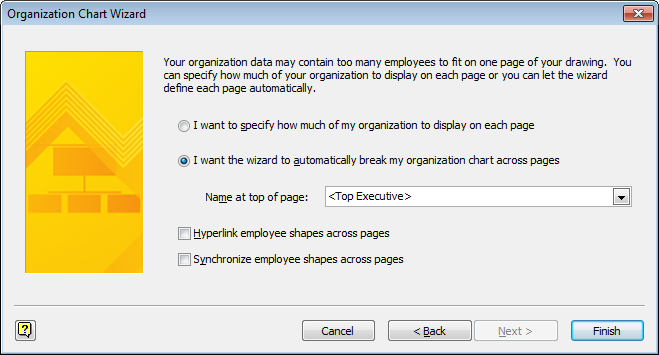 The Organization Chart Wizard assumes that an employee can have only one manager, and automatically filters duplicate employee records. 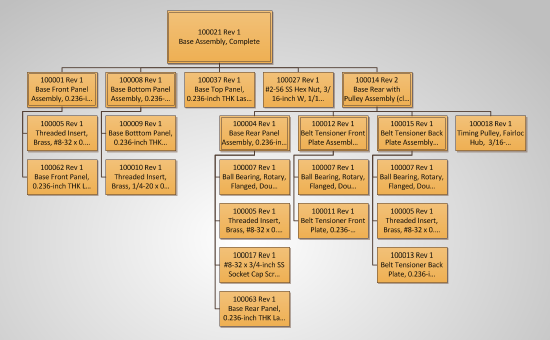 However, our product structure may contain a component that appears on multiple assemblies. So, the data transformation tricks the Organization Chart Wizard by assigning different "employee IDs" to the same part1 based on where it's used in the BOM. 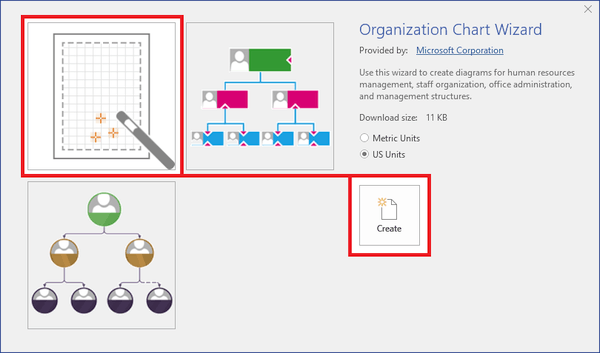 Create a new Visio file using the Organization Chart template. Select the Organization Chart Wizard, which is easier to format than the other options. 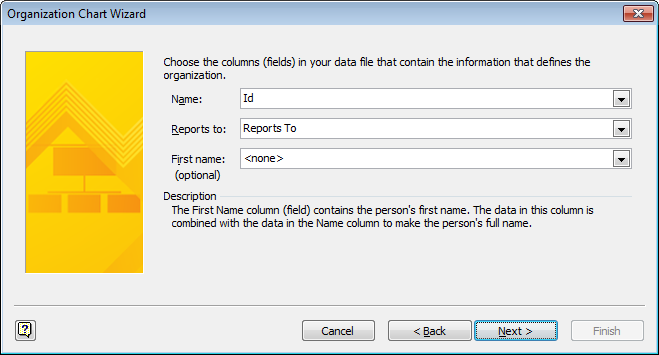 On the Wizard, select Information that's already stored in a file or database, and click the Next button. 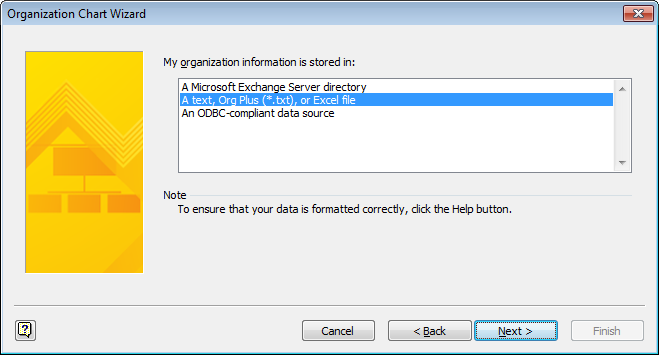 Select the import format as a text file. Browse to find the bill of materials import (.txt) file. The Name: value as Id	column. The Reports to: value as Reports To column. There's no First name: value. 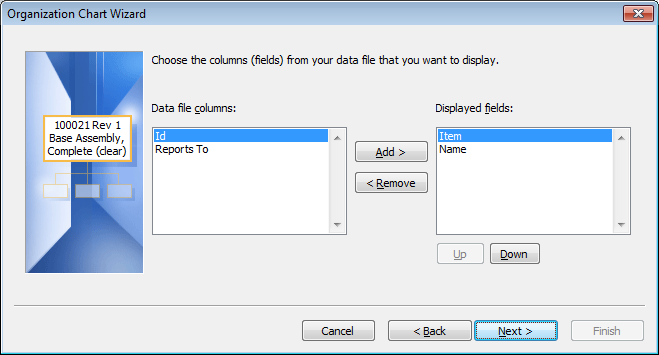 Specify the displayed fields as the Item (part number) column and Name (part description) column. 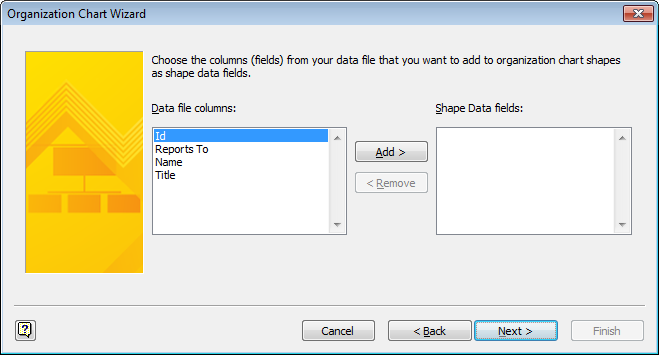 There are no shape data fields in the default data transformation, so click the Next button. Specify the layout options that you want Visio to apply. Click the Finish button. You can use Visio's tools to arrange the objects, and to apply themes and other formatting as desired. The data transformation can be modified to suit your needs. If you have more than a few levels in your bill of materials, use the @MaxLevel value to set how "deep" you want to expand your product structure. To ensure that the item descriptions fit within the Visio boxes, the data transformation provides a @NameLimit value. Change the value to adjust the description maximum length. PDXpert's data transformations are extremely flexible. Other useful data can be exported from PDXpert, and imported into the Visio diagram. The Id and Reports To identify node positions (indent level + find) within the BOM graph. The values are arbitrary, and have no meaning outside of the current file. Excel is not a good editor for delimited text because it can misinterpret Unicode and extended ANSI characters, and convert text with leading zeroes into numeric values or dates.